We were commissioned to design a new home for a couple who were downsizing and wanted a house in the grounds of their B-listed house in a pretty Arts and Crafts village. The new house had to be affordable and good value with one wow space. It had to run economically and be energy efficient. The living area needed to be upstairs to maximise light and views. And the existing B-listed house had to be respected in terms of its features, including access, architectural merits and aspect. With considerable experience in conservation architecture we know the importance of respecting existing buildings, particularly where they have been listed. The big challenge here was to get planning permission due to the fact the existing house was B-listed and the new house was to sit in the grounds, which were not extensive. We know that the key to getting planning permission, even on a difficult project, is about thinking carefully about choices and presenting the whole story to the planning authorities. The way we achieved this was first considering all the issues to find the right solutions. First, we looked at where the new house should be placed on the site. After considerable thought, we positioned it so that the two houses could exist well independently. This involved looking at the different accesses to each of the properties and ensuring the existing mature garden could be preserved. 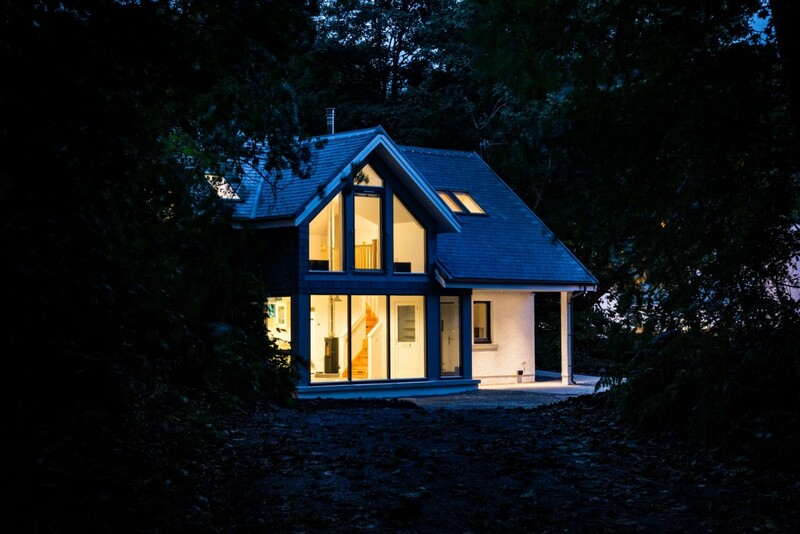 We placed the house so that it sat deep in the woods to the side of the exiting listed house, giving it uninterrupted views across the countryside. We took a bold decision with the clients to design the new building in a contrasting style to the existing 18th-century house. The new house is more crisp and contemporary, yet with a nod to the Arts and Crafts form of the houses in the village. It achieves this with the use of one-and-a-half-storey design, with asymmetrical gable elevations and covered porches – these Arts and Crafts references also helped enable the success of our planning application. The wow space was placed at the heart of the building with a ground-floor living and dining area, as well as in a first-floor living space. This upstairs living space is loosely reminiscent of a tree house in the woods with the upper structure designed to look heavier than the lighter more glazed space below. This promotes an airy spacial feeling downstairs and cosiness upstairs in the living room. All secondary spaces such as utility and plant room are placed on the wooded side of the plan, where the aspect is less light. 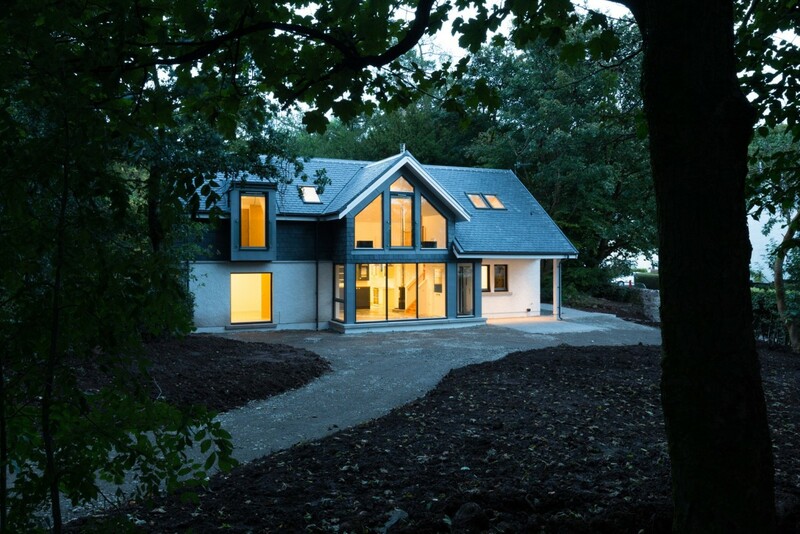 When our clients moved into the house they immediately reported enjoying a warm and cosy new home. They enjoyed the emotional tie of remaining close to their old house in which they raised their family. 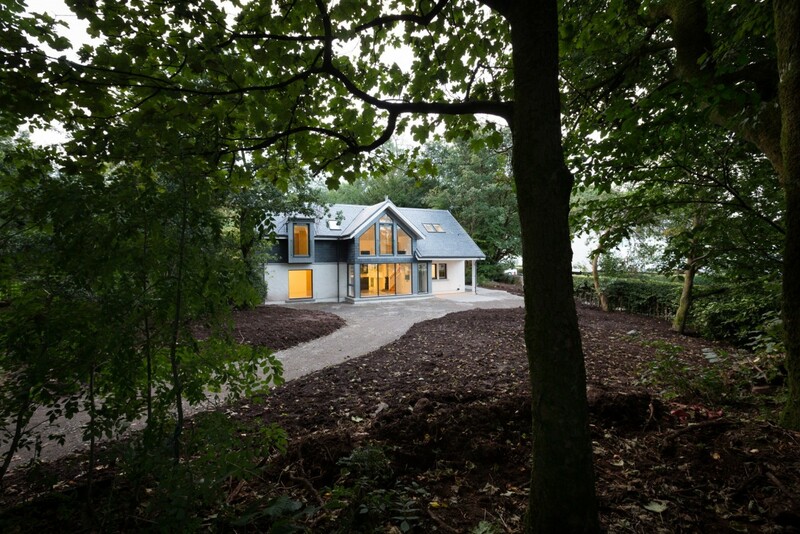 Building in the grounds of their family home has meant they have the best of both worlds – memories of their old house intact and an energy-efficient and cosy new house which is easy to clean, run and maintain. The building also meets and exceeds the current building standards in terms of energy efficiency.